Innovation, awareness and other factors have led to significant changes in how people are working out today. Now, there are numerous workout machines for individuals to use at home or anywhere else. One of the best workout equipment available is superior to rowing machines. The new rowing machines on the market today are far different from those in the past. These are powerful, sleek, compact and able to deliver increased results. They allow you to adequately ramp up your routine and implement positive changes to your cardio health. Most of the top-rated rowing machines let users burn calories at faster clips. At the same time, they also enable muscle building and toning of physique. All done in a low-impactful, quicker and safer way. For those who are searching for an excellent rowing machine to use at the office or home, there are some factors to consider. Overall, there are countless of rowing machines you can purchase now. They come with different features and are available in different styles. Before you decide on which one to purchase, you may want to consider several factors. Although many of the best rowing machines for a home may be a bit costly, others are not that expensive. While the higher cost rowing machines typically provide the best quality, low price rowing machines also deliver. In the end, the balance is finding those which are cost-effective while also providing the best results. These rowing machines reviews are based on customer testimonials, performance, features and other criteria. Using all of these determinants will help make your purchase of a rower much simpler. To make it easier for you to decide on which rowing machine is best, we have narrowed down this review. The following are for the top 5 best rowing machines on the market today. The review and buying guide only includes the best in the rowing machine sector. These are the cream of the crop and best available rowing machines on the market today. One needs to look no further than the Concept2 Model D Indoor Rowing Machine with PM5 to see how far rowers have come. The machine is highly effective when it comes to providing cardiovascular workouts. At the same time, the exercises you do on the Concept2 help fine-tune your body and boost your levels of fitness. Full of impressive features, the model has become one of the best-selling on the market. Also, the Concept2 Model D Indoor delivers what any and every top-rated indoor training rower should. The Concept 2 Model is very dependable when it comes to performance and workout assistance. The superior rowing machine allows users to save a ton of money on yearly membership fees in gyms. That’s because you get all that a typical rowing machine in a gym delivers and then more. All at a fraction of the cost of many other top home rowers. The design is not only aesthetically pleasing, but it is also very innovative and compact. It has a flywheel design which helps minimize noise as you work out. There is a very useful and handy monitor which lets you keep track of your exercises and progress. On the monitor, users can easily see data in every rowing workout with accuracy. Built to last and made of durable material. Easy to move around due to the caster wheels. Precision Performance Monitor 5 provides accurate and easy to follow data on all your rowing. Compact and easy to store since it splits into two pieces. Provides smooth feel in workouts while minimizing noise via the innovative flywheel design. 5-year frame warranty makes it a smart buy. Made out of durable material and it’s also very sturdy. Easy to assemble, store and move around. Ergonomic handle and adjustable footrests make accommodation of different shoe sizes a cinch. Very comfortable, quiet and smooth. Cost-effective when compared to similar expensive machines. Takes up more space than some anticipate. Some find the apps and PM5 monitor difficult to use or not to their liking. The seat on rower may not be comfortable for some people. A bit costly for some. The results are in on the Concept2 Model Indoor Rowing Machine, and they are excellent. Based on customer reviews, features, performance and pros, the Concept2 is worth purchasing. Those that use it rave about its performance, durability, and effectiveness. They also love how smooth the slide as well as how high the rowing motion is. While some users may desire more from the PM5 and apps monitor feature, others found it extremely useful and helpful. There is also very little magnetic resistance and very easy to assemble. Those who have already purchased the Concept2 Model D Indoor Rowing Machine with PM5 have nothing but great things to say about it. We were very hard-pressed to find any negative reviews. Those who did give the superior rowing machine less than five stars did so base on issues not related to the rower itself. Instead, they were either sent the wrong color, or the box arrived late or damaged. Presently, the Concept2 Model D Indoor Rowing Machine has some of the highest ratings on sites such as Amazon. The majority of customers truly loved their purchase and were all too eager to say why in their testimonials. One user wrote “This machine may save my life” as he mentioned how great it was for helping him lose weight. There was also another verified purchaser who stated “Superior quality and easy to use” in his review. In another testimonial, a customer remarked how “Amazing sturdy, the high-quality machine” the Concept2 was. The world of home fitness has gotten much easier thanks to the Sunny Health & Fitness SF-RW5515 Magnetic Rowing Machine Rower w/ LCD Monitor. 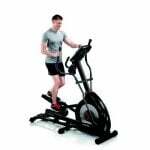 The fantastic and convenient rower has all you need to achieve a great cardiovascular workout. It is full of useful features, compact, rugged and very affordable. The Sunny Health & Fitness rower also has an LCD console which lets you count calories, time and scan. Right out of the box and after some assembly, you will be ready to go and begin yours at home workout. The Sunny Health & Fitness SF-RW5515 Magnetic Rowing Machine Rower w/ LCD Monitor is fun and easy to use. But more importantly, if you are looking to lose weight fast, then this is the machine for it. You can easily track your progress with the useful digital monitor screen. The LCD monitor is very convenient when it comes to monitoring what you have done. For the intensity of your workouts, you have a switch. Using the Sunny Health & Fitness SF-RW5515 rower’s switch lets you change up the resistance according to the exercise. Users are also provided with some sturdy and large pedals on the sides. They have safety straps which help keep your feet in place as you workout. The seat is very comfortable since it is cushioned. Up to 8 levels of resistance, you can adjust quickly. Handy LCD monitor to help you keep track of calories, time and more. Anti-slip pedals are plentiful, and grip handlebars are non-slip. Wheels for easy transportation are built in. The comfortable seat is fully padded. Compact and innovative design is great for those with limited space. The adjustable switch provides many levels of resistance. They are priced much lower than most typical top-rated rowing machines. Easy to assemble, fold and put away. Some find the monitor hard to see since the numbers are a bit small. No way to track the number of meters you have rowed. May not be for those who plan to have several people working out on it. As far as the price is concerned, the Sunny Health & Fitness SF-RW5515 Magnetic Rowing Machine Rower w/ LCD Monitor cannot be beaten. It is very well priced and affordable for those looking to work out from home without spending too much. However, anyone who plans on using a rowing machine a lot or has others who will use it as well should think about purchasing it. Although Sunny Health & Fitness is well-built, it is not a professional rowing machine. Some users did complain about the rowers breaking down after using it too many months later. On the other hand, if you want to work out from time to time or use it moderately, then it is a great buy. You can tell a lot about a product based on testimonials from customers who purchased it. For the most part, the majority of reviews regarding the Sunny Health & Fitness SF-RW5515 Magnetic Rowing Machine Rower w/ LCD Monitor were positive. Many of those who bought the top-rated rowing machine loved how much easier it did their at-home workouts. There was a user named L. Rollins who stated “Ab Fab Rowing Machine!” in his review. Another person wrote “Great workout, great price, easy to use” when speaking about his experience with the Sunny Health & Fitness. A user by the name of Isabella extolled how the Sunny Health & Fitness rowing machine provided a “Great workout, definitely with the money” in her review. Individuals are looking to obtain an excellent rowing machine to use at home or anywhere else should consider the Stamina ATS Air Rower. The powerful and effective rower delivers when it comes to providing a rigorous cardio workout. You can also build strength and sculpt your body with the rowing machine. The innovative design is not only pleasing to the eyes, but also very compact. The Stamina ATS Air Rower renders enough power to let you hone in, tone and strengthen your muscles such as your glutes, legs, arms, and abs. Besides, the wind-resistance innovative design has been engineered to deliver users maximum efficiency. The Stamina ATS Air Rower is a workout from home machine built to make your life easier. Since it does not take up too much space, people can use it almost anywhere. The seat provides support, and it slides conveniently to accommodate anyone according to a person’s specific body and size. It comes with a built-in multi-function monitor. You can see the time; calories burned, distance and speed. The pedals are big enough to fit any person’s foot size, and it has nylon foot straps which are adjustable. The Stamina ATS Air Rower is constructed with material made to last. You will find grips that are textured for keeping your hands comfortably in place and stable as you row away. Plus, since it has an easy to fold away frame, it makes storage simple. Wind resistance design allows users to achieve smooth, efficient and effective smooth rowing strokes. A useful LCD to help track your progress. Folds away neatly to save space. Made of durable material designed to last. 90-day parts and 3-year frame warranty. Very easy to follow instructions for assembling the unit. Comfortable padded seats and large footplates for all feet sizes. Built-in floor protectors prevent rowing machine from skidding and provide safety when working out. Innovative wind resistance design renders smooth and effective rowing capabilities. LCD monitor allows you to keep track of calories burned, miles rowed and much more. Automatic air transfer system adjusts to your workout intensity. Low impact and great for people of any age. Easy to store away due to its to fold capability. The fan can be a bit noisy during extreme workout sessions. The LCD monitor is very simple and basic. No resistance setting for those who want to choose their levels of intensity. With its air rowing capability which makes it dynamic, the Stamina ATS Air Rower is in a great piece of machinery to have at home. Assembly is quick and easy since it only takes about 30 minutes on average. The features such as the rubberized feet are excellent. They protect you and the floor as you row away from the calories. Also, the innovative and compact design makes it easy for people with limited space in their home. Most of the best rowing machines on the market are typically much more expensive than this unit as well. That makes the Stamina ATS Air Rower not only a bargain but a smart buy as well. No products found. No products found. At home workouts just got a lot easier and more productive with the top-rated WaterRower Natural Rowing Machine with S4 Monitor. Utilizing the latest technology and durable materials, it is among the elite on the rowing machine’s list. The unit has a patented WaterFlywheel which mimics boat rowing dynamics. Much like rowing in a boat in the water, the dynamics of the WaterRower provide amazing results. Aesthetically pleasing, the design factor also makes it workout equipment that stands out from other similar machines. The replication process found on the WaterRower Natural Rowing Machine with S4 Monitor is one of the things which makes it unique. The machine is also handcrafted for precision and quality. Using an enclosed water tank where the flywheel is encased, renders quiet and smooth resistance. The self-regulated resistance allows for a rowing experience rarely produced on other units. Since the machine has no moving parts, wearing down over time is not an issue. Also, neither the pulleys nor the recoil belt needs any maintenance or lubrication. The flywheel and water tank eliminates the requirement for a motor. Users love that as you paddle faster, there’s an increase in the drag which is the same as with real rowing. Beautifully handcrafted and made with durable materials. State-of-the-art monitor with series four performance. Able to track heart rate, stroke rate, intensity and more via the performance monitor. It’s made out of stained honey oak and solid ash. It’s exceptionally constructed to absorb vibration and sound. Can be easily stored upright. The built-in water tank of water for real rowing experience. The innovative performance monitor can track your heart and stroke rate as well as your intensity. Doesn’t require any maintenance or lubrication which makes its parts last longer than other machines. Easily fits in most spaces since it can be stored upright and weighs only 24 pounds. Renders real and natural flowing and smooth rowing simulation which is unsurpassed. Feels much less mechanical than other metal machines. Very smooth and quiet when working out. Does not include the Heart Rate strap or internal ANT+ transponder. It cost a little more than most other rowing machines because of its quality and features. Takes up more space than other smaller and cheaper rowing units. The WaterRower Natural Rowing Machine is in a class by itself. Many consider it a high-end workout from home equipment. When it comes to any product, one of the best ways to tell how great a unit will perform for you is by the customer reviews. Based on the total amount of positive reviews and what it delivers, this machine is worth considering. Although you may end up paying a bit more, you get that back in performance, features, and many other forms. The real rowing experience gained from the WaterRower is also something which makes it stands out. Plus, the assembly is easy to do and is aesthetically impressive. There are a large number of customer reviews which help paint the story for those thinking of purchasing this unit. The majority of the testimonials are positive giving the WaterRower Natural Rowing Machine a high score. Most customers had nothing but great things to say about the WaterRower. For instance, a person named H.C. stated “5.0 out of 5 stars. It was solidly constructed but was easy to assemble.” Another user wrote “5.0 out of 5 stars. Beautiful to look at and a fantastic exercise” in his review. Then countless other people simply wrote “Five Stars” on their testimonials. Compact, innovation and great workout results all come together in the Stamina Body Trac Glider 1050 Rowing Machine. The full range of motion found on the rower is unique and superb. It intelligently mimics the rowing characteristics of being on a boat in the water. Those looking for a low-impact unit which provides a complete body workout’ will enjoy the Stamina Body Trac Glider 1050. The Stamina Body Trac is perfect for individuals who need a cost-effective and affordable rowing machine. Research has already proven the benefits of rowing workouts. With this rower, people can quickly work out from home or anywhere else. The no-nonsense Stamina Body Trac Glider 1050 lets you workout without taking too much space. The portable and compact rower has full-range-of-motion features and fits in many areas. That is great for those with limited space since it also stands for storing once you are done. The arms are foldable, and the hand grips are padded with foam for comfort. Many found the steel frame construction to be sturdy. The rower has a useful electronic monitor which aids in keeping you motivated and informed of your workout. For a rowing stroke which is smooth, there’s a hydraulic resistance which is adjustable. The footplates on the unit are textured and have straps to help keep your feet secure. The Stamina Body Trac Glider only weighs 37 pounds and can be moved from side to side with ease. There’s a hydraulic cylinder which is adjustable and ball-bearing roller mechanism for arms resistance. Useful digital monitor to help display your workout progress. The frame is made of steel construction which is strong and sturdy. The hydraulic cylinder is adjustable for smooth rowing stroke resistance. Hand grips on the unit are padded with foam. The molded seat is very comfortable. Arms can fold to allow more accessible storage. The full range of rowing capability mimics the sensation of being on the water. Efficient in letting a person target important muscle groups via the low-impact aerobic exercises. Allows you to tighten and strengthen your arms, glutes, legs, back, and abdominals. The digital multi-function monitor helps to keep progress of your fat and calories burning simple. Cost much less than other similar rowing machines. The straps on the footplates are not as big as some would prefer. Does not have the same amount of features found on more expensive rowing machines. Assembly directions could be better. Few users found them vague. Anyone not looking to spend too much money while also desiring an excellent rowing machine should consider this unit. Besides being cost-effective, it also lets you workout from just about anywhere since it is so compact. Although there are a few cons, the pros seem to outweigh them. The Stamina Body Trac Glider 1050 replicates actual rowing. The resistance adjustability, digital monitor, pricing and positive reviews, make it an excellent choice. What Muscles Does A Rowing Machine Work? Is It Worth Using? The workout industry and market have exploded in the past few years. There is no shortage of great at home workout machines. With so many to choose from, finding the right one can be a difficult task. However, when you narrow them down based on the most critical factors, it helps make your selection process more manageable. These top 5 best rowing machines on this buying guide prove that. All of them are top-rated and among the best. The bottom line is that whichever one you choose from any of these three, will likely deliver the type of results you desire.